Kroger, Amazon, Goodsearch and Adopt a Shelter are super easy ways to have your personal shopping benefit TLC. Below you will find a list of places that will donate to us when you shop with them or websites were you can by items to be donated to TLC. Read below for all the details. Amazon will donate 0.5% of your purchase of eligible items to TLC Humane Society. All you have to do is go to smile.amazon.com and be sure to select TLC Humane Society as the charity of your choice. You will know it's correct when "Supporting: Dahlonega-Lumpkin County Humane Society, Inc." shows up at the top of the Amazon page. BISSELL Partners for Pets - TLC Humane Society is proud to be a Partner for Pets! BISSELL and LostPetUSA.net have teamed up to help organizations like ours raise money, and now you can help too! When you purchase pet products on bissell.com and enter the code ADOPT at checkout, a portion of your purchase will be donated to our organization! TLC is proud to be a part of the Adopt A Shelter program. When shopping online at any of the stores below plus many more, TLC will receive a donation at no cost to you. You'll receive the same prices and great deals from these fine merchants. Please click here before shopping at your favorite stores. You will be directed to the Adopt A Shelter website where can select where you want to shop! Pretty easy! 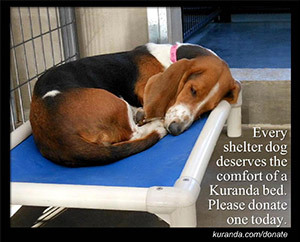 You can donate a Kuranda Bed to TLC, it's easy! Click the picture above to purchase one from our wish list and it will be sent directly to the shelter and put immediately to use. The animals will appreciate having a great, comfortable bed to lay on. TLC will receive a portion of all the shopping you do at Kroger. All you have to do is link your Kroger card to TLC. It's super easy! 1. Go to www.krogercommunityrewards.com, sign in with your Kroger information or create a login. If you have to create a login, you will get an email verification to sign up. 2. Under your account you will see community rewards. Search for TLC Humane Society by our name or number 23472. 3. Select and save and your on our your way to helping us raise money! Get $10 off any BarkBox subscription and support TLC! For every coupon used on www.BarkBox.com, our rescue will get a $10 donation from BarkBox. Be sure to use our special promo code: TLCHSBBX1 - Help us meet our goal of 100 subscriptions and raise $1,000.